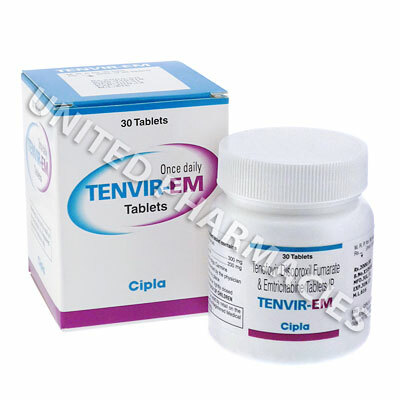 Tenvir (Tenofovir Disoproxil Fumarate/Emtricitabine) is indicated in combination with other antiretroviral agents for the treatment of HIV-1 infection in adults. Each film coated tablet contains 300mg of Tenofovir Disoproxil Fumarate and 200mg of Emtricitabine. Tenofovir Disoproxil Fumarate is an acyclic nucleoside phosphonate diester analog of adenosine monophosphate. It requires initial diester hydrolysis for conversion to tenofovir and subsequent phosphorylations by cellular enzymes to form tenofovir diphosphate. It inhibits the activity of HIV-1 reverse transcriptase by competing with the natural substrate deoxyadenosine 5`-triphosphate and, after incorporation into DNA, by DNA chain termination. It is a weak inhibitor of mammalian DNA polymerases alpha and beta, and mitochondrial DNA polymerase gamma. Emtricitabine is a synthetic nucleoside analog of cytosine, is phosphorylated by cellular enzymes to form emtricitabine 5`-triphosphate. Emtricitabine 5`-triphosphate inhibits the activity of the HIV-1 reverse transcriptase by competing with the natural substrate deoxycytidine 5`-triphosphate and by being incorporated into nascent viral DNA which results in chain termination. Emtricitabine 5`- triphosphate is a weak inhibitor of mammalian DNA polymerase alpha, beta and epsilon and mitochondrial DNA polymerase gamma. The dose is one tablet taken once daily taken orally with or without food. Strictly follow all instructions provided to you by your physician or pharmacist while using Tenvir (Tenofovir Disoproxil Fumarate/Emtricitabine). Optimum and safe dosage can differ based on the patient and the condition being treated. Patients should consult their physician immediately if any of these side effects persist or worsen, or if they notice any other more serious side effects. It is important to discuss fully the risk of all potential side effects with your physician before taking this medication. As Tenvir (Tenofovir Disoproxil Fumarate/Emtricitabine) may be unsafe for certain patients, it is essential you always inform your physician if you are pregnant or breastfeeding, as well as if you have any allergies, other illnesses, or ongoing health conditions, and if you are taking any other form of medication, supplements, or herbal products. Patients suffering from Hepatitis B should inform their physician before taking this drug as their condition may need to be regularly monitored while taking this medication. This drug should not be used in combination with nucleoside analogs. It is contraindicated in patients with previously demostrated hypersensitivity to any of the components of the products.